While intended for Netflix subscribers, Fast.com’s simplistic approach to testing download speeds is rather refreshing. After all, other sites such as Speedtest.net, Speakeasy.net/speedtest, and even SpeedOf.me (which doesn’t require flash or java) are littered with ads and sometimes confusing with all their options. Even our 3Gstore support team would agree that it can be difficult for a less experienced individual to understand and use these other speed test sites. Fast.com is certainly a blessing! Just launched yesterday, Fast.com takes the guess work out of the equation and gives people a way to see whether they have a fast enough connection for streaming video (or whatever you may be using your connection for). Visit the website and it immediately starts testing your download speed. During the test, you have the option to pause it if necessary. They also include a little FAQ section, which you can get to by clicking the ‘?’ button at the bottom. We all want a faster, better Internet, yet Internet speeds vary greatly and can be affected by other users on your network or congestion with your Internet service provider. When you’re experiencing streaming issues, fast.com allows you to check the download speeds you’re getting from your Internet service provider. 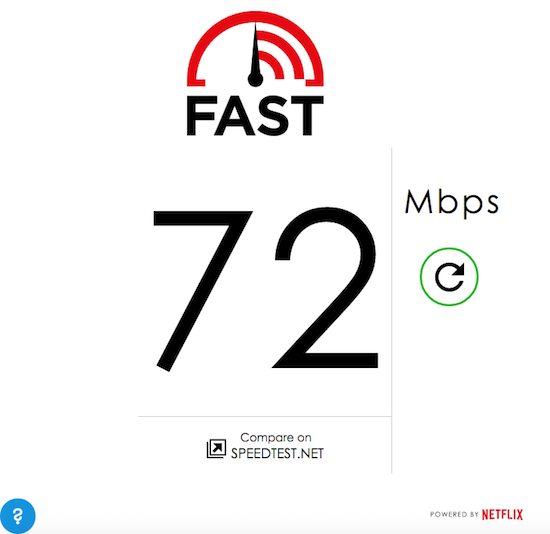 Using Netflix servers, fast.com works like other globally available tools including speedtest.net, and the results should be similar in most cases. This consumer speed test is different than our Netflix ISP Speed Index. Fast.com measures your personal Internet connection at any given time. The speed index measures average monthly speeds of actual Netflix streams during prime time hours. As a side note, there’s no mobile app available at this time. However, the website is optimized for mobile viewing and works just as well as it does on a desktop/ laptop.